Among the sequins, spandex and sewing machines of La Nouba’s wardrobe department stands Yusuke Funaki. His über-lean body is perched in front of a mirror as he carefully outlines his right eye with black eyeliner. His powder-white face has one perfectly arched, painted-on eyebrow. 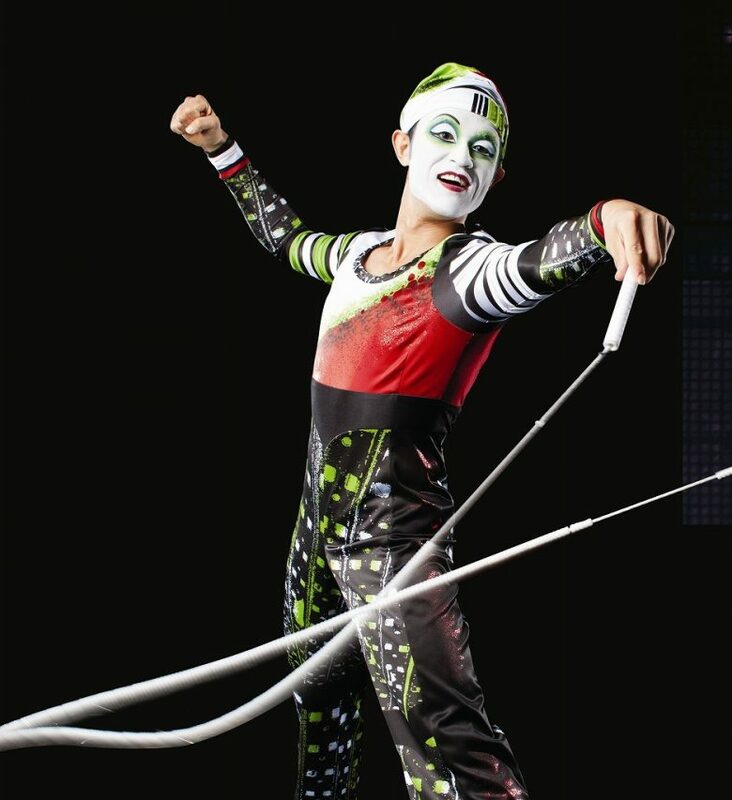 By 6 o’clock, he’s tackling amazing jump-roping feats on stage as the opening act of Cirque du Soleil’s La Nouba. And at 9 o’clock, he’s on stage again. He repeats this schedule Tuesday through Saturday. In his down time, he’s still bumping up his circus-act repertoire. That means jazz class once a week, ballet on Wednesdays and martial arts— thanks to impromptu lessons from the Red Pierrot character—nearly every day. His intense curiosity may stem from the fact that he’s only been a Cirque performer since 2010, he’s had no formal training in the business, and his background is in aerospace engineering. All that said, it makes his path to Cirque all the more extraordinary. Funaki, 33, grew up a shy, plump boy in Okayama, a bucolic area of southwest Japan surrounded by the Chūgoku Mountains. His parents managed a trucking company that was started by his grandfather. He played baseball, “but I was not a good player,” he recalls. Funaki opted for video games and science projects instead. After graduating from high school, he became an engineering student at Tokyo Institute of Technology, which is ranked as one of the best universities in the world. On his occasional study breaks, he’d indulge his creative side by reading Japanese comic books, joining friends for sushi or watching theatrical performances. Yusuke Funaki charms the La Nouba crowd with his jump-rope skills. He was so impressed that he stopped by a sports shop immediately afterward and purchased his first jump rope; he started practicing once a week at the park. During this time, he was a research student at the Japan Aerospace Exploration Agency where he studied the movements of a robotic arm on the International Space Station. He received his master’s in engineering and took a job in the research and development division of tire maker Bridgestone. Funaki did not land a license the first time around. But a year later, in 2008, he got in. Two more years went by as he honed his skills, creating an act that was part skipping rope and part rhythmic gymnastics. 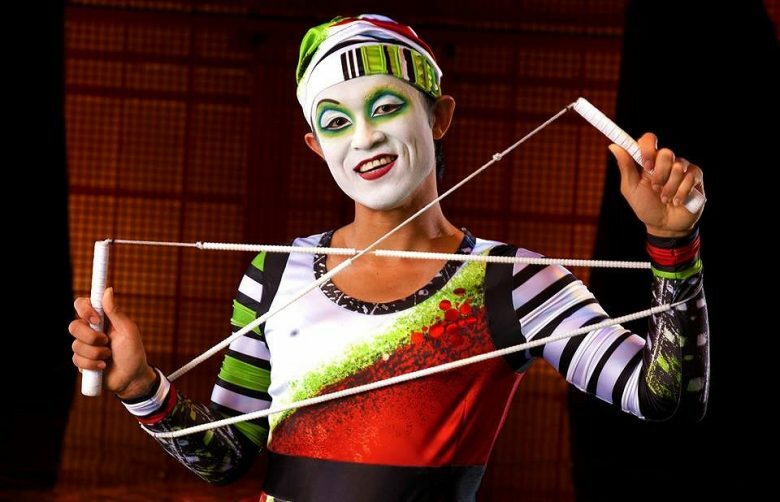 Come 2010, five years after he first saw Quidam, he decided to send a video to the Cirque du Soleil casting team. A month later, Cirque contacted him. Ironically, they asked him to fill in for Quidam. “The skipping rope soloist had a back injury and would be out for three months, so they offered me a contract,” he says. The only snag was Quidam is a touring show and at the time, it was in Brazil. For Funaki to secure a visa, it would take at least a month. His dream was within reach, but the timing was off; Funaki thought it was over. Coincidentally, that summer the team at La Nouba decided to freshen up the show’s opening act by nixing the German wheel act and replacing it with a skipping-rope show. Better yet, they wanted Funaki. It’s late afternoon by now, and Funaki has on red lipstick, a ring of green and yellow eye shadow around his almond-shaped eyes and his leg is stretched on top of a set prop. So he asked for advice. The La Nouba ballet dancers told him to just have fun, and it would happen naturally. By 6 p.m., the lights in the theater have dimmed, the dramatic music begins, and the clowns are winning over the crowd. Suddenly, Funaki bolts onto the stage, jump rope in hand, with a wide smile that shows he’s mastered it all.